New Jigoku Shoujo wallpaper! :) I can't wait for the next season (not completely for the actual show, but for new scans! I'm running out of stuff to do...). Anyways..about the wallpaper. I felt like doing something creative... I used this scan. As you can see...it was only half Enma's head. I drew in the hair how I thought it should go if it were sprawled out on the ground. I made the background to be a room somewhere in her house. On the ground, I made it look like worn tatami mats. I orginally had vertical and horizontal tatamis, but even when I did it in perspective, it looked weird... So all horizontal is good for me. ^_^' For the bamboo on the sliding door, I vectored this picture. The hanging scroll in the center says "Shizukesa" which means "Tranquility." Enma is having a tranquil moment with the butterfly. XD The title refers to the butterfly Enma is "playing" with. Chiisai Tomodachi -- Small Friend. Oh yeah, I also left out the blood because I didn't want Ai-chan bleeding. I had a lot of fun making this wallpaper and I hope some people like it. Now this is an emotive wallpaper. Gosh I love the perspective - it's oh so magical. You did an excellent job drawing the part of her head not in the scan. Putting her in the room was a good choice - really helps set a mood of tranquility, which is what you were going for. OMG, when i saw it i knew who is jigoku fan boy! it looks great! i like your background, it looks so original, and vector is amazing, and its beautiful! This really looks great, the vector is awesome. After vectoring Ai so often it seems you can extend her hair just finen (I'd die in the process). XD The bamboo wallpaper looks great and I like the use of textures. Just so I can bother you with nerdy details: A tatami is supposed to be 180cmx90cm or 90cmx90cm. Hellgirlll MOE-POWER god bless you! Hey,,You did a great job ! With the eyes ,, I really like that way. Crimson red blood in her eyes wah OX ...and her face very smooth and clean. 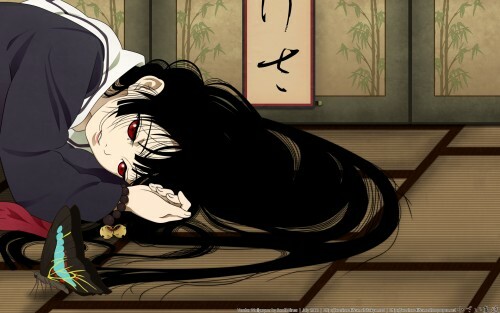 I love her hair so much , they're dark and harmonious with the floor. This's so Splendid! Yes, there are going to have a season 3! That's a good new for the fans. I need to be honest that I didn't even watch her anime but this time I will. I wish I could get in if I didn't see 1st & 2nd seasons. Wow, really nice wall! Really nice job with her hair! Love the background! like always,your hell girl wallpapers really seem to impress me all the time. i really hope you would keep making wallpapers for jigoku shoujo,and maybe make one out of the 3rd season:jigoku shoujo Mitsuganae. this one's really good;i love how you did the butterfly. Emma looks really nice - her pose and her face are adorable. Very sad but beautiful. I like it very much! It is absolutely beutiful! I love the details! I think this anime is really interesting! The hair and the colours are gorgeous! You are very talented! This is definitely a fav! great job! the details is done nicely.. beautiful! its so pretty, i love it! The butterfly is very beautiful..
One phrase...going in my desktop shuffle.